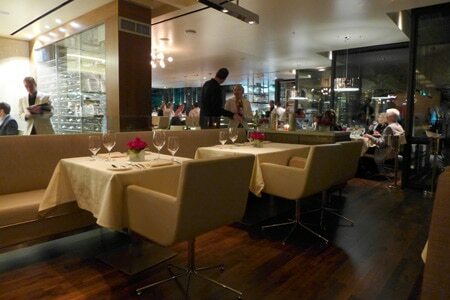 A modern steakhouse in a romantic cliffside setting at The Ritz-Carlton, Rancho Mirage. : Perched in a cliffside setting overlooking the Coachella Valley, The Edge at The Ritz-Carlton, Rancho Mirage certainly lives up to its name. It's a modern steakhouse with a few nods to the past, including servers in white dinner jackets and the music of Frank Sinatra serenading guests. The dining room turns up the romance with cozy corners, glass wine cellars, white tablecloths and red roses. Floor-to-ceiling windows showcase the sprawling views. The full menu is also served at the bar by the entrance and the tall two-top tables adjacent. If you arrive early for your reservation, you could also enjoy a cocktail and the panorama outside among the lounge chairs and heat lamps next to the restaurant. Executive chef Bruno Lopez is a longtime veteran of The Ritz-Carlton properties. He also cooked for the Hotel Bel-Air in Los Angeles before landing in Rancho Mirage to oversee State Fare Bar & Kitchen and The Edge. He's recruited a talented pool of chefs, including Linton Romero, a Patina alum with experience from Nick & Stef's Steakhouse. Starters range from Hawaiian blue prawns to veal tongue "pastrami" to charred octopus with petite potatoes and smoked paprika vinaigrette. The Edge features its own dry-aging room, where select cuts of grass-fed, corn-finished beef are aged 21-65 days. These Prime steaks, such as the dry-aged rib-eye, are sure to please the most discerning of carnivores. If you really want to indulge, go for the Satsuma Japanese Wagyu from Kagoshima Prefecture on the island of Kyushu in Japan. Choose from several house-made sauces and traditional à la carte sides. The other entrées cover a little of everything: Maine lobster, braised lamb shank and European sea bass with caper-raisin relish, to name a few. Edible flowers adorn enticements like the chocolate lava cake with tangerine sorbet. Consider yourself fortunate to experience these creative and flavorful desserts from pastry chef Kimberly Ayala, another rising star on the culinary team. She also makes light and fluffy marshmallows. The wine list presents very nice offerings, from cult California wines to French classics such as Château Lynch-Bages. There are about a dozen wines available by the glass along with craft beers, classic cocktails and a bourbon-focused bar program. At the end of the meal, a cordial cart is wheeled to the table to tempt diners with a digestif of Grand Marnier, Sambuca or Fernet-Branca.